This is your guide on what to wear in Iceland during winter. Don’t worry – we’re from Canada so we know what we are talking about! Travelling to a country with “Ice” in the name may sound daunting, but in reality it likely is not as bad as you think. That being said, we also live in Edmonton which recorded temperatures of minus 58 degrees celsius in 2009. Don’t worry though, Iceland will not be nearly as cold! 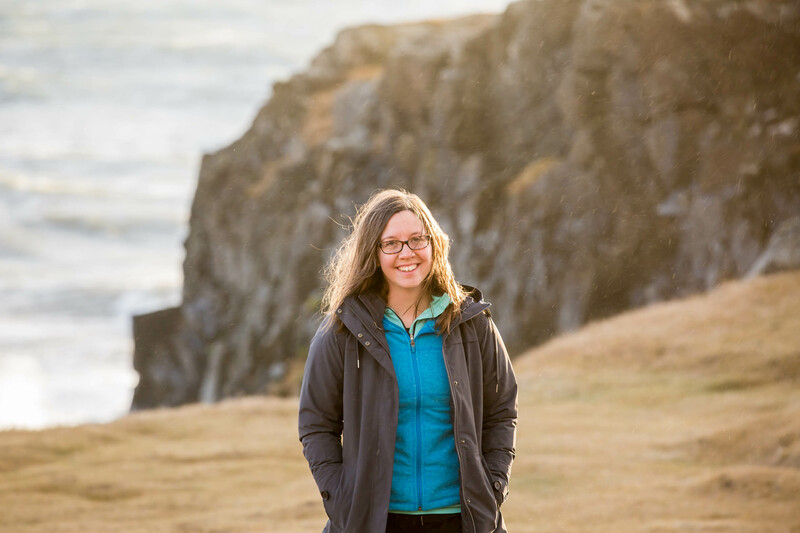 One of the first questions we asked ourselves when planning our trip was what to wear in Iceland during winter. 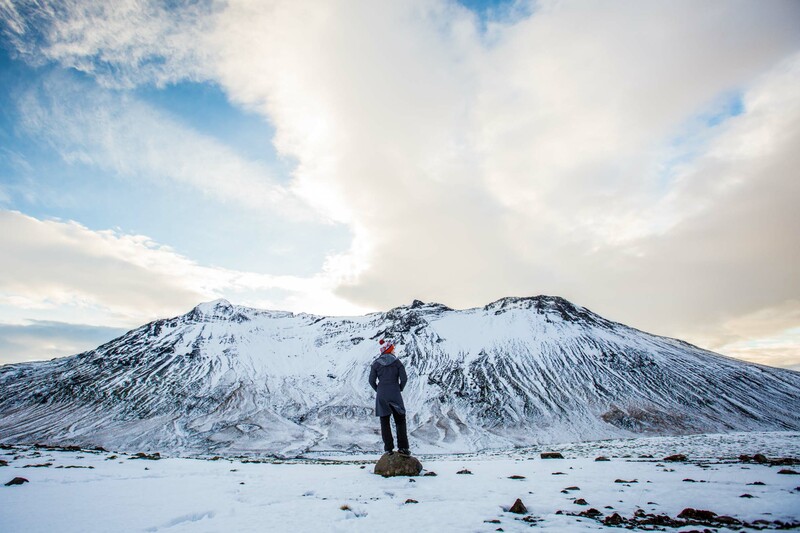 We quickly realized that a lot of the clothes we currently own would be way too WARM for Iceland in winter! We ended up buying a bunch of new clothes to better suit Iceland’s winter climate, which is relatively mild thanks to its location in the Gulf Stream of the North Atlantic. 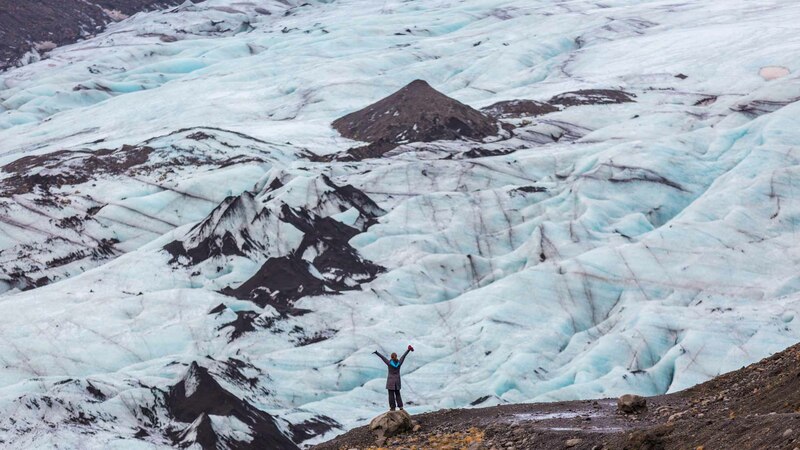 If you’ve been planning a trip to Iceland, I’m sure you have already heard “If you don’t like the weather, wait five minutes.” It may sound like a joke, but it is entirely truthful. You never know what to expect and the weather can change so quickly. The best advice we can give is to be prepared. With that in mind we will tell you a little about our experience with Iceland in winter. To start with, we are not fancy people. We did not care about things like what the winter fashion is in Iceland. We cared about staying comfortable and enjoying out trip as we drove ourselves around for 7 days. 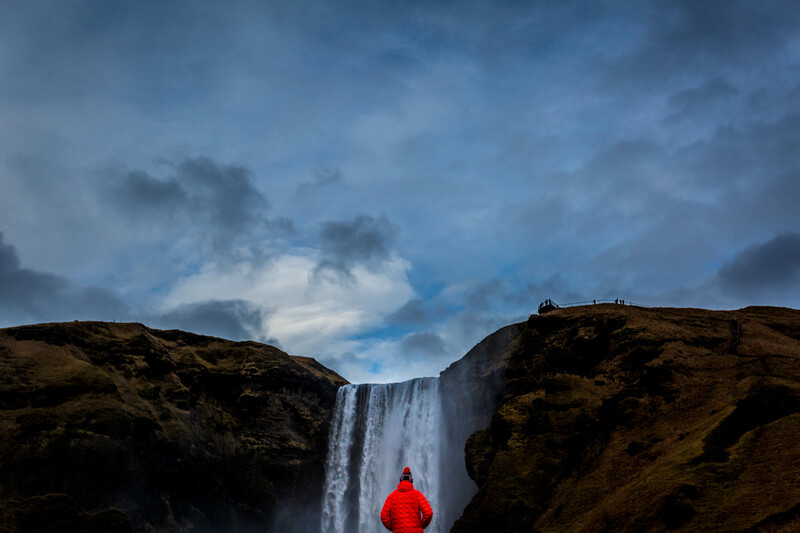 We were concerned with whether or not to bring waterproof pants to Iceland. We had to make decisions on which of our winter boots we should take to Iceland – not based on fashion, but based on function. You will definitely need winter boots! When we say “winter boots” we don’t mean fuzzy Uggs that look good but offer no traction. You will be walking in and through snow and ice. If you want to enjoy your trip, get boots that will keep your feet warm, and keep you balanced on slippery terrain. 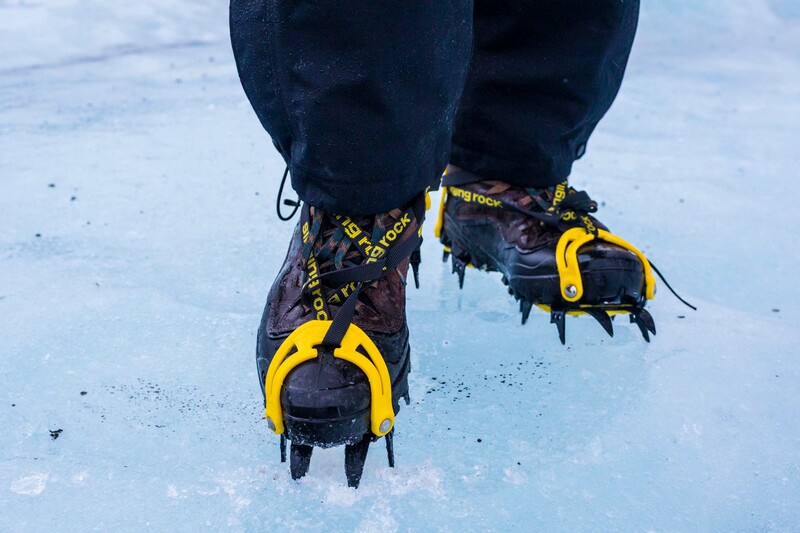 If you have crampons, bring them! You never know when they’ll come in handy. If you don’t know what I’m talking about, check out Yaktrax. Get some good socks. We like these double layer socks. They will keep your feet warm if its cold, and also wick away sweat if its warm. Wool socks would also be a great idea – just make sure your feet fit in your boots with them, as they tend to be thicker than regular cotton socks (we always advise people to avoid cotton as much possible). If you have the space to spare in your bags, bring a small pair of shoes you can wear indoors. If you are staying in a guesthouse or hotel and want to walk around inside but don’t want to wear your drippy dirt boots, a pair of small runners or canvas shoes will do the trick. Windproof, waterproof, warm. Those are things you need to keep in mind. We experienced winds up to 110km/h. You don’t want to get caught outside in that unless you are wearing some warm clothes. The ambient air temperature could get down to as cold as -10 or -15 celsius, but add strong winds coming off the ocean and it could feel much colder. Be prepared. Hopefully you’ll get mild temperatures like we did (never got cold than freezing), but just in case, have a good winter jacket. Definitely waterproof! 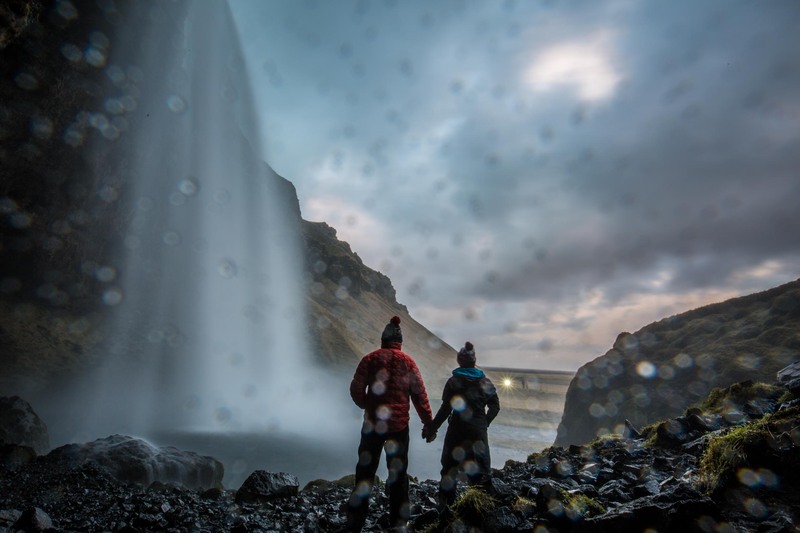 You will experience rain, you will explore waterfalls, you may experience snow. Wear a waterproof jacket – ideally one with a hood. Pack some light mid-layers. 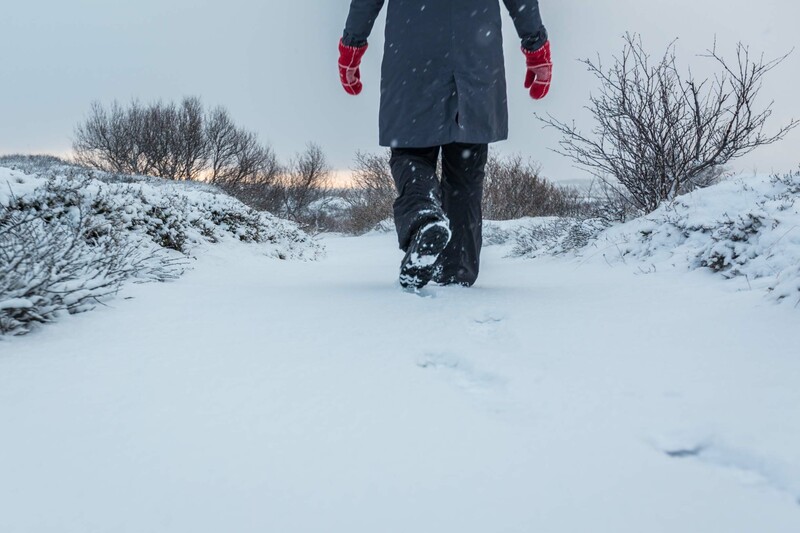 If you are used to cold temperatures, pack something a little lighter so that you aren’t roasting and sweating if the temperature is above freezing and you are doing lots of walking. Merino wool is great to keep you both warm and dry! Windproof, waterproof, warm. Keep these things in mind again when choosing your pants. If you plan on visiting waterfalls, I would highly recommend some rain pants! Warm bottom layers – if you plan on exploring outdoors you’ll want something better than just regular blue jeans. Most jeans will soak up water like a sponge and allow the wind to freeze your legs. Rain pants. We had purchased some rain pants when we hiked The West Coast Trail and were super glad we brought them to Iceland. When walking around waterfalls you will get soaked. Bring rain pants. Bring versatile pants – hiking pants/cargo pants are great for when you are exploring. Leggings are great for long days in the car – and you can always toss your rain pants over top of them when you are outside. Bring a swim suit! Part of the Iceland experience is enjoying a swim in hot springs. Plan your hot springs stop ahead of time so that you can plan accordingly. Some will provide slippers & towels or robes, but others will not. If you are travelling to Iceland in the winter and plan on going to a hot spring, make sure you either pack a towel or one is provided for you! Jess swears by Icebreaker underwear. IceBreaker can be expensive but she really liked their customer service and their lifetime warranty. At the first sign of wear you can take the item in for exchange. Sunny loves his Under Armour underwear and wears it whenever travelling or shooting weddings. It breaths well and allows full movement without bunching. We definitely advise not to wear cotton. If it gets wet it will chafe and you will be uncomfortable. Bring regular travel clothes like PJs, T-Shirts, Tank Tops, and a couple of sweaters/long sleeves. Again, try to avoid cotton as it does not do well against wind and water. Active-wear clothing is best, as is wool. His – Great for taking pictures as you can still access most of the camera settings, but your hands don’t freeze! 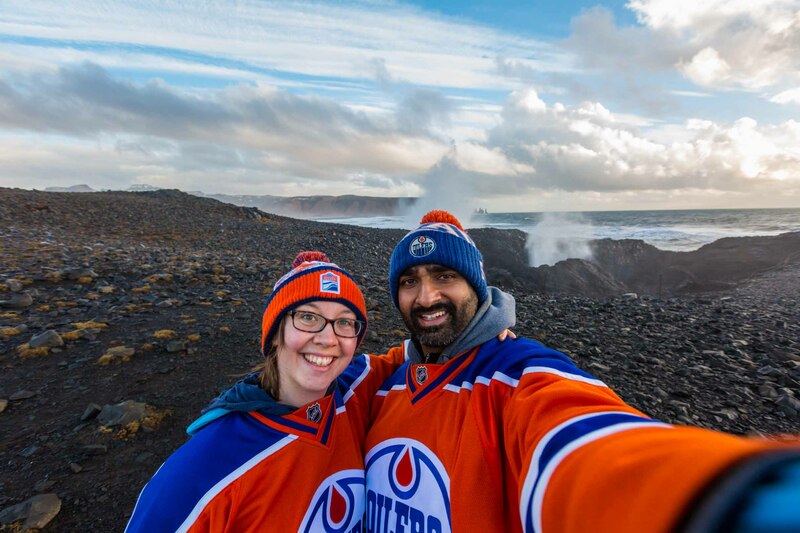 Toques – we brought our Oilers toques because they are super warm, cover our ears fully and added a touch of color to our photos. Definitely bring some kind of head gear – BASEBALL CAPS ARE NOT RECOMMENDED! The number of tourists we saw chasing down baseball caps was hilarious. The wind is very strong and will rip anything with a brim off your head. Bring a toque. Scarves – Sunny never used his, but Jess used hers a lot. Bring something to cover your face. Sunny’s jacket had a great hood that zipped up to his nose, so he was covered. Don’t wear cotton! Merino wool & active wear clothing is best. Iceland can be very windy and wet. You want to be comfortable. Bright colours! If you plan on taking pictures you’ll want to wear something so you stand out. If you are going in winter there will be lots of white snow, black mountains & grey skies. Wear bright colours if you can. Function over fashion. Thats our motto anyways. We literally could not care less what people wear in Reykjavik when they go clubbing. We never went clubbing. We went exploring! We saw waterfalls, mountains, the ocean, black sand beaches, glaciers and rivers! We wanted to be comfortable when doing so. Waterproof, windproof and warm. Its simple. Keep your feet protected. Solid waterproof winter boots and wool socks are highly recommended. Our goals for this trip were to explore and enjoy natural Iceland. We wanted to not only drive the ring road, but also check out things off the beaten path. We knew we would be driving, and in and out of the car for 8-10 hours each day. We wanted to be comfortable. We wanted to be warm & dry and we packed accordingly. If you have any questions about what to wear in Iceland during winter. please let us know!